The death of Billy Graham has led many to reflect upon what it means for America. The popular evangelical figure was more than a preacher. He was a man-symbol who represented the way much of Protestant America has practiced religion over the decades. His message was much more temperamental than doctrinal; more personal than social. Liberals might wish to turn his death into that of old-time religion. Such an evaluation is hasty and wishful thinking on their part. America remains deeply religious. However, the focus has changed. Billy Graham catered to the needs of the time. His message reflected the construction of a universal consensus in America that started with the founding and flourished in the fifties. It was a formula of life and worship that sought to make everyone get along. It held that all might engage in a constant and ever-elusive search for perfect happiness so much a part of the American way of life. According to this consensus, all parties employed the same concepts, imagery, and rhetoric: God, freedom, the American flag, family, and apple pie. Everything blended together smoothly to make this ideal work. There was only one problem with the happiness formula. If all sought personal happiness without virtue as a moral compass, it would soon turn into a recipe for chaos. Disordered passions would be unleashed upon the land. America would not prosper. That is why, unlike Europe, America embraced religion as a kind of guarantor of good order through a consensual Christian moral code loosely based on the Ten Commandments. This code was adopted by the State, embedded in the nation’s laws and engraved on public buildings. This religious consensus had the good effect of deeply imprinting upon the national character a sense of morality, godliness, patriotism, and family devotion. Its moral code helped moderate the culture and the economy. Moreover, the evils of communism threatened the nation, this code helped strengthen the nation with discipline and virtue. America prospered materially. Billy Graham was the figure that helped build this religious consensus as America exercised its post-war leadership of the Free World. His brand of evangelicalism provided Eisenhower’s “deeply felt religious faith” to help everyone get along across all party, ideological and cultural lines. In the time of anti-communism, his condemnation of sin stiffened the Cold War effort against the evil Soviet empire. However, this American religious consensus inadvertently went beyond the original goal of fostering natural unity and good order. It created what might be called a “Ten Commandment America.” Tens of millions of Americans developed a healthy attachment to moral values even when often failing to live up to them in daily life. However, like all things vague and undefined, this religious consensus could not withstand the storm of revolution. When the sexual revolution of the sixties exploded, the consensus started to unravel and scatter. And Billy Graham waged a rear guard action war to preserve what remained of the American consensus. 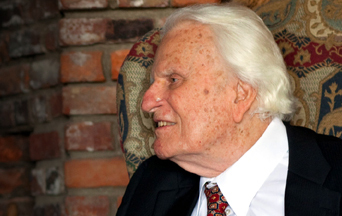 Thus, it might be said that Billy Graham’s death represented the end of religious consensus. Little remains as America is polarized and fragmented today. However, his death did not represent the end of religion. The engineers of the sexual revolution had hoped that America’s vague religious consensus would gradually fade into a secular one, as in Europe. They assumed the desire of getting along would trump the religious observance of moral law that can cause controversy. What started off as a deeply felt sentiment that guaranteed order and prosperity began to assume another character. When the vague religious consensus lost its cohesion after the sixties, the countless Ten Commandment Americans throughout the country coalesced around ever more defined issues like abortion, the family, traditional marriage, property, school prayer and love of country. This resistance was enough to pose an obstacle to the left’s brutal revolutionary agenda. Billy Graham’s fading religious consensus ironically gave rise to the coalitions that are waging America’s Culture War. With the death of Billy Graham, a major symbol fades into the past. However, the focus of the fight has completely changed. America faces a secular and atheistic offensive against moral values that is becoming ever more radical. His message is no longer tolerated. That is why the Culture War will intensify and eventually God will win. This entry was posted in Fighting the Culture War, News Commentary and tagged abortion, America, Billy Graham, Christian, coalitions, consensus, country, Culture War, death, Family, God, Law, love of country, man-symbol, moral, moral code, moral values, nation, Order, prayer, religion, Ten Commandment, Traditional Marriage by John Horvat II. Bookmark the permalink.